The area of the proposed development next to the Montessori. CONCERNED RESIDENTS IN Skerries have lodged an appeal against a decision to allow a fast food restaurant to be built 300m from a primary school. Fingal County Council last month granted permission to an application to construct a two-storey restaurant with a drive through at Skerries Point shopping centre on Barnageeragh Road. The application was submitted last summer by the company Marbleside Ltd, and was met with fierce local opposition. 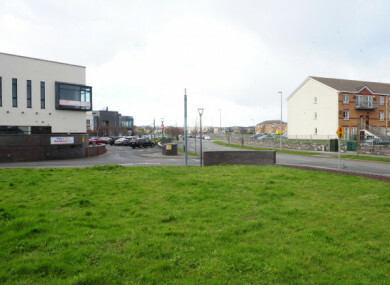 Concerned Skerries residents banded together to form the “Drive Thru Committee” in June of last year to object against the proposed development. Locals expressed concerns about the proximity of the planned restaurant to the local Educate Together National School, as well as the fact that it is adjacent to the Kelly’s Bay Montessori School, and the impact that this could have on children’s health. Fundraisers were held in order to raise money to hire a professional engineer and planner to help people lodge evidence-based objections to the application. In total, local residents lodged 156 objections to the planning application at a cost of €20 per submission. The campaign had wide support from local TDs, senators and councillors. Fingal came back to Marbleside requesting further information, and ultimately granted permission for the development earlier this month. Residents objected strongly to the decision by Fingal County Council to grant permission for the restaurant and immediately went about preparing and appeal. A standard third-party appeal was lodged with ABP last Friday. Locals have also requested an Oral Hearing over the decision. A GoFundMe page to finance the Oral Hearing was set up on 13 March and managed to raise €5,810 in 10 days. The money raised is being used to hire a planner and engineer to lodge a professional application and to have them prepare for a full Oral Hearing on the council’s decision. A recent recommendation laid out in a recent Oireachtas Children’s Committee report states that government should enhance planning powers to stop the opening of new fast food outlets “within a defined vicinity of schools”. An expected decision date on the appeal will be provided by ABP in the coming days. Email “Skerries residents appeal decision to allow fast food restaurant to be built 300m from school”. Feedback on “Skerries residents appeal decision to allow fast food restaurant to be built 300m from school”.